The courts have made certain technologies available to aid with proceedings. The overall solution is a blend of several different technologies. The following document is intended to provide an overview of the systems available in court and provide instructions on how to use those that are available to court participants. Access to most of the technology in the courtroom is controlled through an AMX panel which the judge and/or court staff will operate. 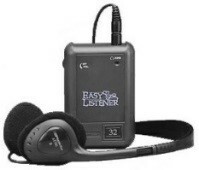 Assisted Listening Devices - Assisted Listening devices are available in each courtroom. They consist of a headphone and wireless receiver which will allow any party in the courtroom to have the audio amplified. If needed you may request one from the court staff. Displays with Audio - There are multiple displays in each courtroom. Small 10" displays are located at both the plaintiff and defense tables, witness stand and the judge's bench. A large 70" display is located at the the front of the courtroom. Additional 23" displays are located in the jury box. The judge and court staff have control over which displays content can be played at. Any audio to be played as a part of video content will be played over the courtroom speakers (Requires HDMI connection or VGA connection with separate audio cable). Cables are available from court staff if needed. 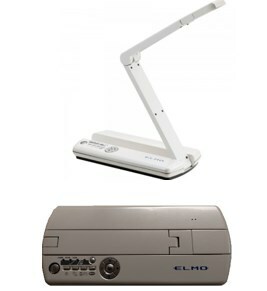 Elmo Overhead Camera - The Elmo overhead camera is a small lightweight (1.5lb) device that can be setup at either the plaintiff or defense table to project the camera's image to the displays in the courtroom. This is ideal for displaying drawings, diagrams and objects. It will also work well with cell phones to display images or text messages. Video Conference Calls - A Polycom video conference system is available in all courtrooms. The court staff will be able to provide the dial in number to the Polycom. It is highly recommended to schedule and perform a test call with the remote party prior to the hearing date. 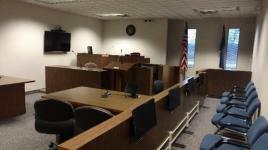 Audio Conference Calls - The courtroom is configured to allow conference calls. You will need to provide the court staff with the number to be dialed. The staff will establish the call through the AMX Panel. The microphones and speakers in the courtroom will be used throughout the conference call. Microphone, Speakers - Microphones are located throughout the courtroom. They are located at both the plaintiff and defense table, podium, walk-up area in front of the judge, the judges bench, witness stand and the jury box. Any audio picked up by the microphones is amplified and played back into the courtroom to make it easier to be heard. The speakers throughout the courtroom are also used to playback and audio from a video source or conference call. Cameras - There are cameras located in the courtroom. These cameras and the associated microphones are ALWAYS ON even when not recording and can be heard by court staff from OUTSIDE the courtroom. Recording - All court proceedings are recorded utilizing the cameras and microphones throughout the courtroom. The judge has control as to when the system is recording. Podium - A podium is provided to present your case. The top of the podium can be rotated 270 degrees in order to face the judge, a witness, or the jury. A panel on the right top side of the podium can be pushed in to release the top for rotation. Technology Liaisons - The courts have a staff of Technology Liaisons available to assist with setup on using the technology in the courtroom. Staff are available during normal court hours 8:00 am – 4:30 pm and are located at the 16th Judicial Circuit Court. If you are intending to use the technology in the courtroom it is recommended to schedule an appointment BEFORE your court hearing in order to address any issues or in the case of a video call, to test the connection with the location to be dialed.  You may request assistance through the Court Clerk or you may contact the Technology Liaisons by either emailing them at CIS@macombgov.org or by calling 586-469-5159. The following directions will provide you with the steps necessary to access and utilize the technology within the courtroom. Overview: There are multiple displays throughout the courtroom. There is the large courtroom display, smaller displays located at the defense, plaintiff tables, the judge’s bench, witness stand, and several throughout the jury box. They are grouped into three categories. (Main Display, All Displays and Private Displays). Private displays include the judges, witness, jury, plaintiff and defense tables. Locate one of the POPUP plugs. There is one at both the plaintiff and defense tables. Press down on the cover and the connections will “POPUP” out of the table. Press on the cover again until you hear a clicking sound to recede it back into the table. You will need either a HDMI or VGA cable in order to connect your device to the displays. ** Court Staff should be able to provide you with a standard HDMI or VGA cable. Depending on the output of your device you may need to provide an adapter. Once connected, inform the court staff that you would like to use the displays. They will configure the AMX panel for the desired displays. ** Please note if you require audio to also be played, it is recommended to use an HDMI cable. If you must use a VGA connection, you will also need a male to male audio cable. If you do not see an image on the small 10" displays, make sure they are turned on. The power button is located on the bottom on the right hand side of the screen. If no image is being displayed on any of the screens, make sure your device is set to output video (sometimes a function key on a laptop) and have the court staff double check the AMX input settings. 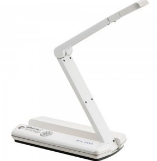 Overview: The Elmo unit is a portable overhead projector camera system. If the unit is not stored in the podium, please ask the court staff to provide the unit. The unit will need to be plugged into a power source and then connected to the displays in the courtroom via one of the POPUP plugs at the defense or plaintiff tables. The unit is able to auto-focus, digitally zoom in and out and display in both color and black and white. 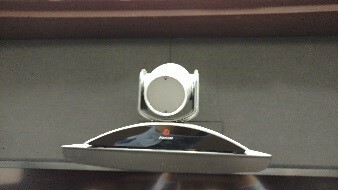 The Elmo may be used where there is a video connection within the courtroom such as the plaintiff or defense tables. Connect either a Micro-HDMI, HDMI or VGA cable to the Elmo unit. Connect the other end of the cable to the associated POPUP plug connection. Plug in the power cord and connect to any electrical outlet. Extend the camera arm on the Elmo and place the item to be viewed beneath it. On the AMX panel select the proper connection and the display group if desired. It will either be Prosecution HDMI or Defense HDMI depending on which table it is setup on. Inform the court staff ahead of time that you would like a party to the case to participate in a hearing via a conference call. The judge will decide whether the call will be permitted or not. The court staff will initiate the call for you. Once connected the microphones and speakers in throughout the courtroom will be used for the conference call. Let the court staff know prior to your hearing date that you have a party that would like to participate via video conference. The judge must approve the use of audio or video calls. The remote party will need to either have access to a Polycom video system or have a PC which they can download and install the Polycom software called RealPresence. Before downloading they will need to fill out a questionnaire. Once the Polycom is up and running you may initiate a video call by entering the number either through the AMX display or by using the Polycom remote. You may also select an existing number from the directory by pressing by pressing the DIRECTORY BUTTON or answer and incoming call by pressing the CALL button. The four arrow keys and select button act the same as the navigation buttons on the Polycom remote.